I always looked to buy a new bike in the last years. My old bike disappeared one day from the garage and i never replaced it. 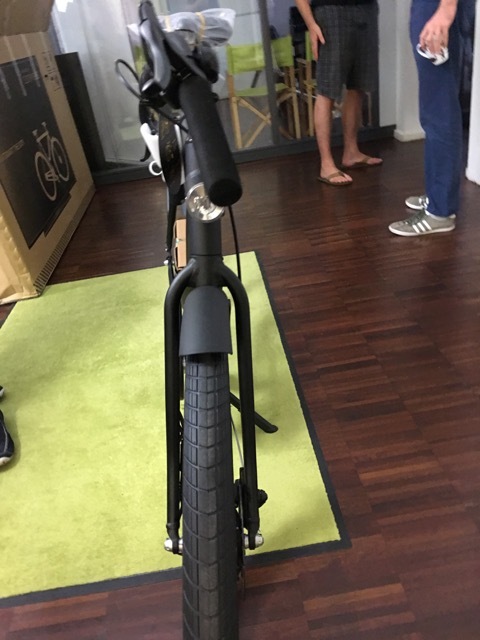 I am unsure, when i saw the bikes from VanMoof for the first time, but their straightly designed frames stroke my eye and I had them on my wish list for quite a long time. 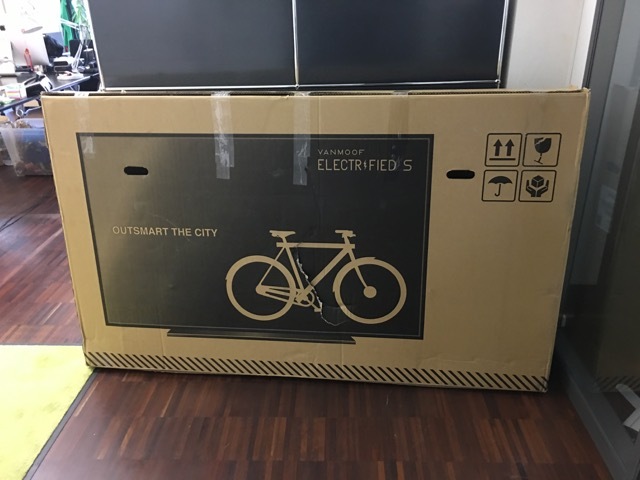 In times where all your friends start buying and driving their Tesla model I was looking for an electric bike because my friend Chakir won one at his employeers raffle and i could ride it for some moments. I must also admit that peer pressure at dkd office has added another dimension to my wish to have a bike. The bandwidth of bikes being brought to Kaiserstrasse range from conventional lady bikes to upscale mountain bikes. 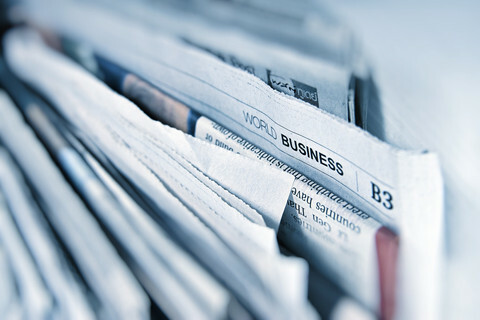 In march this year i remember seeing a newsletter mail hit my inbox. VanMoof was announcing the pre-sale for its new flagship bike: Electrified S. I put a reminder in my calendar, so that missing the start of the sale could not happen. The bike is being shipped with a specialised company and its box is quite funny. VanMoof has observed that shipping companies do not really care about bikes being sent around, so they decided to hack the process. They designed the box to mimic the look of a giant flatscreen tv. It seems that this has a substantial influence on the treatment of the load inside the box. Once the bike is out of the package you need to attach the pedals and adjust the height of the saddle. The handlebar needs to be put in the right position too. Now the bike and its batteries need to be charged. In the meantime I have registered an account at the my.vanmoof site. The web app asks me which bike i own. I need to enter my Framenumber and the IMEI number that is included in the starter kit. After that i download the VanMoof Application from the iTunes Store. I log in with my credentials and find that the app has paired with the bike. Wow that was easy. 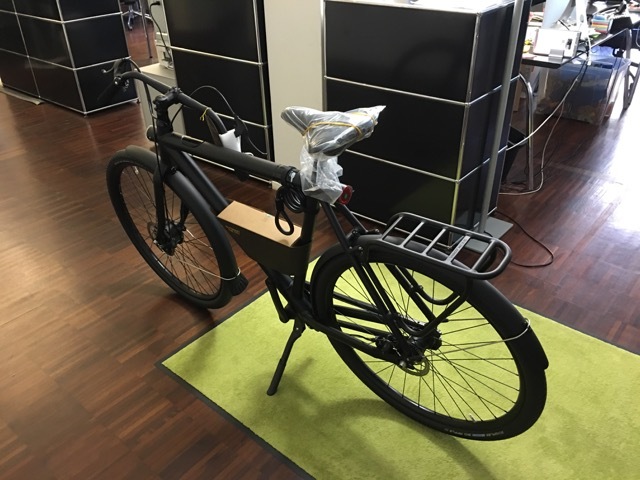 Luckily my bike has arrived on a monday so that i have to work while the batteries are charged. 6 hours later the energy level has arrived at 100%. Its time to go home, better to ride home. The weather is magnificent: sun is shining, temperature is great. I start to ride and the feeling is quite like a normal bike. Oh wait! I had deactivated the power assistance while playing with the app. A short stop at the next traffic light to change this. Oh my god! What a feeling! Some seconds later i look at the speed i am riding on: 25 Km/h! When was the last time i was that fast on a bike? Must be years! I pass a bridge over the river Main. Going up is so easy! Now i am really convinced. This is how i expected it. I follow my short ride home and have to stop at a traffic light again. Once the lights turn green i decide to push the booster button that add additional power to the accelaration. This is nice. The motor is very silent and ends to work once i end pedaling. Its built in the front wheel. 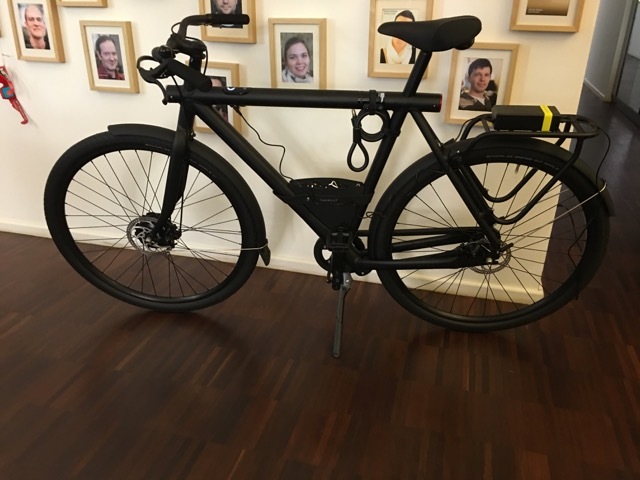 If you dont know that this is an electric bike you might think that this is a normal bike. I must say that i am very happy with my VanMoof Electrified S bike. I will keep you posted on this. Too bad that summer is nearly ending.